La Fortuna is a fun little town located at the base of Arenal Volcano. This is one of the most popular destinations in Costa Rica. There are many hotels, restaurants, and activities to choose from. 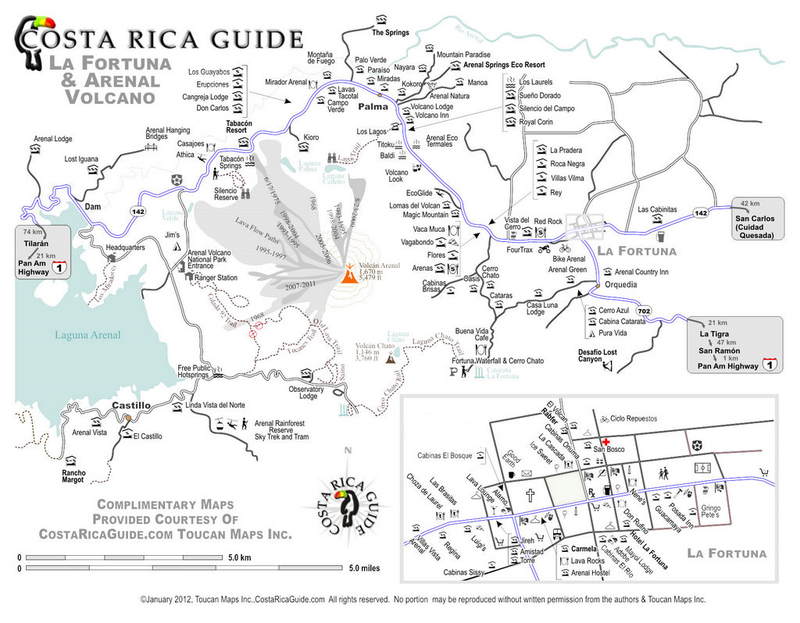 The following map of La Fortuna is provided by our friends at Toucan Maps, Costa Rica Guide. You can click the link below for a full-size version or follow this link to a printable map of La Fortuna at the official Toucan Maps website. Click here to view the full-size map of Arenal Volcano and La Fortuna. The following map of La Fortuna is an interactive map using the latest Google technology. Zoom in or out or pan left, right, up or down with the controls on the left. Latitude: N 10° 28' 16.57". Longitude: E 84° 38' 49.07"